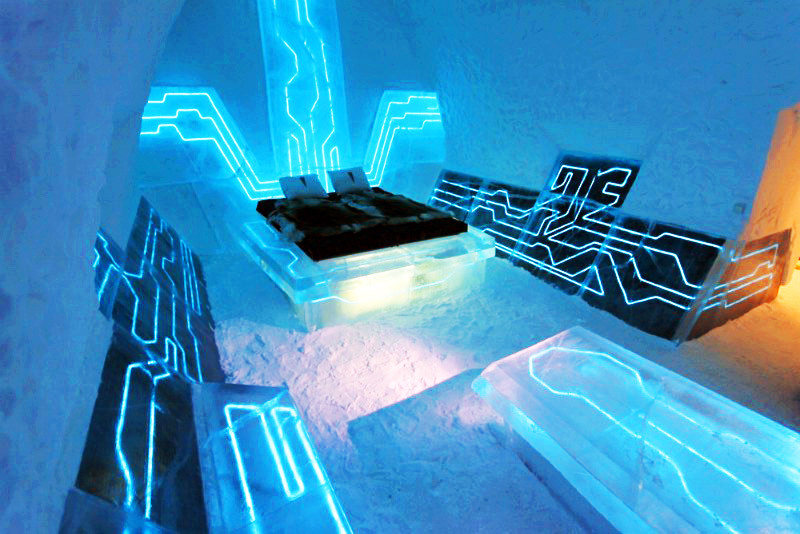 With the much anticipated 3D TRON: Legacy coming out in theaters next week, a set of British designers are celebrating the Disney movie with a suite at the famous IceHotel above the Arctic Circle in Sweden. The electric blue Tron-inspired lighting scheme is achieved by cutting grooves into the ice, inserting energy efficient EL wire and then icing over the wire to keep it in place. Ben Rousseau and Ian Douglas–Jones' art suite at the IceHotel, "Legacy Of The River", is part of their campaign to launch a new line of illuminated furniture and interiors products due out early 2011. EL wire, or electroluminescent wire, is an energy efficient lighting technology used for a wide variety of applications. An EL wire is composed of a copper wire coated in a phosphor that glows when an alternating current is applied to it. The energy efficient technology allows just a few hundred feet of EL wire to be driven by AA batteries for several hours. Ben Rousseau and Ian Douglas–Jones, a designer and an architect by training, joined forces to work on this project as well an illuminated furniture line to be released next year. 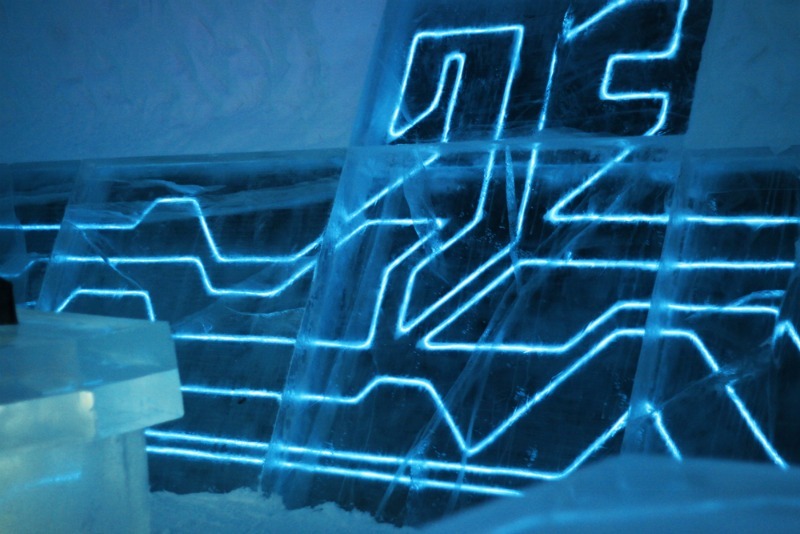 The duo were asked to create a TRON-inspired art suite for the Icehotel this winter using the EL wire to provide a futuristic lighting scheme. They had 13 days to build out the interior of the hotel room suite, install the lighting and polish and buff out the interior furnishings, which includes wall panels, a reindeer pelt covered bed and a table. Grooves for the EL wire were cut into ice slabs with a variety of tools and then the wire was laid into the grooves and water was used to create new ice to “glue” the wire into place. The Icehotel in Lapland, Sweden is the first, largest and most famous of the various ice hotels around the world. Each year the Icehotel is constructed anew and artists and designers are asked to collaborate in the process. A large warehouse and various snow and ice making techniques are utilized to create ice blocks, ice slabs, snow packed domes, furniture and features that make up the temporary hotel. The duo were also being followed around by a video crew who shooting for a TV show called Extreme Design, which will feature designers working in extreme conditions. Temperatures reached -32 degrees Celsius, and the duo were outfitted from head to toe in Oakley winter gear in order to stay warm as they built their suite in the Swedish hotel. So cold!! Why would you do that?? For the Legacy of the River suite, the designers embedded EL wire into the ice over a black background to give the room a Tron-look. The suite includes a bed, lighting panels as well as a table - all embedded with EL wire. The energy efficient lighting technology needs very little energy and consistently and evenly glows in 360 degrees. Architect Ian Douglas-Jones and designer Ben Rousseau joined forces to create the Tron-inspired suite, which will also help launch their illuminated furniture line in 2011. The Icehotel in Lapland, Sweden is the most famous, first and largest of the ice hotels. It is a temporary hotel, lasting from December to April. Each year the hotel is newly built and artists and designers are asked to collaborate in the design and construction. Ben and Ian were sponsored by Oakley, who provided them gear and winter clothing to work in the extreme conditions that reach a low as -32 degrees Celsius. Ben and Ian use various cutting tools to position the ice slabs and then cut grooves in which to place the EL wire. The EL wire is laid in the grooves and then water is sprayed over to create a layer of ice as if they were "gluing" the wire into place. Chisels, hammers, picks and other tools like hair dryers were used to build, smooth, polish and buff out the ice. The suite includes many light embedded panels, as well as a bed and table that all had to be created by hand. Here Ben and Ian take a break after some of the lighting has been installed and is working. Cracks in the ice are illuminated. The entrance to the hotel all lit up. Playing with light wands outside of the hotel. Even more light wand action in the corridor of the hotel on the way to the TRON suite. Ben and Ian taking it easy on the bed post light installation. 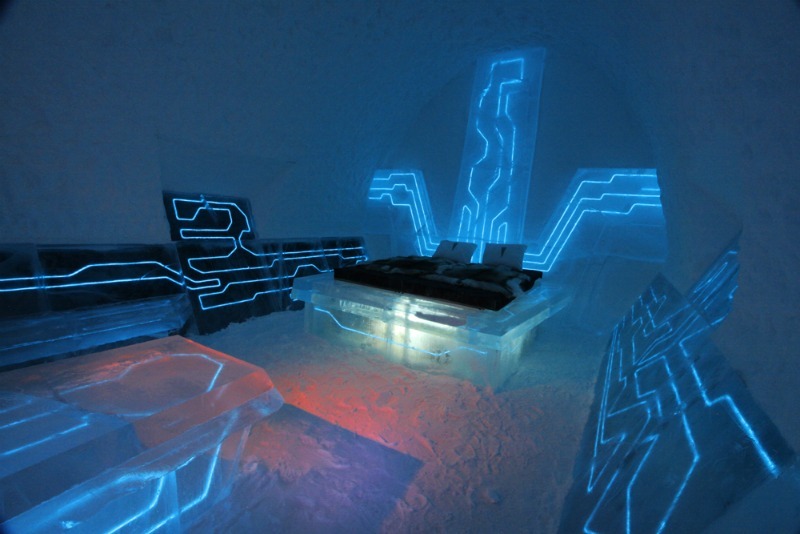 As per tradition at the Icehotel, each designer spends a night in their room after its completion.